Destination Cannock Chase supports all businesses who provide accommodation for visitors, however establishments who are part of a recognised quality scheme are indicated by star symbols as shown below. 1930's detached house with a new extension. Fully centrally heated. Guests dining room with facilities. Private car park. No smoking. Town centre location. Full English breakfast available. Set in an 18th-century farmhouse, The Barns Hotel offers spacious elegant rooms with traditional charm. All bedrooms are stylishly decorated with natural colours and contemporary art, have ample storage space and have modern en-suite bathroom facilities with fresh luxury towels. The 21 bedrooms include a luxury suite, superior double rooms or standard twin and double rooms with flexibility for families and disabled guests. The Cathedral Lodge Hotel is an independent family run hotel comprising of 36 comfortable en suite rooms, excellent function & conference facilities, licensed bar and a superb restaurant. Set in the heart of the beautiful city of Lichfield, Staffordshire's premier heritage city just a two minute walk from the city centre and the magnificent cathedral. Our friendly staff will ensure your stay with us is relaxing and comfortable. Established over 30 years ago, The Cedar Tree Hotel is named after the 400 year old tree in its grounds. Now under new management, it has been extensively refurbished and offers excellent facilities throughout each of its 33 rooms, including family suites, single, double and twin rooms, each with its own en suite bathroom, colour television, direct dial telephone, ironing and coffee making facilities. We offer room only or bed & breakfast, please contact us for room tariffs and availability. Magnificent Grade II listed Queen Anne residence set in a picturesque village on the edge of Cannock Chase Forest. All Bedrooms have Central Heating, Fully Double Glazed, Colour TV with Freeview, Tea & Coffee, Radio Alarms. All breakfasts are freshly cooked to order and, where practicable, sourced locally. Salt-free and vegetarian diets catered for. Private car park for about eight cars: garage available on request. We are also 'Motorcycle friendly'. Situated on the edge of Cannock Chase Forest the Cottage Bed & Breakfast is one of the oldest buildings in the area dating back to the late 1770’s. It has been recently extended and refurbished but has completely retained its original character. Relaxed friendly atmosphere and computer points available. This Grade II listed building has been an established hostelry for the past 400 years. Located between T6/7 of the M6 Toll at the Roadchef motorway services, Days Inn Cannock provides the ideal stopover. Guests can also enjoy either a continental or Full English breakfast. The Roadchef restaurant and Costa Coffee outlet can get you ready for your onward journey. Privately owned and manged by the Pette family since 1984. Hotel, Restaurant, Health Club and Spa. •60 en-suite bedrooms and suites with FREE high speed internet access, digital television and Sky Sports. The family owned Fairway Motel is situated in the heart of Rugeley and has 18 rooms that can sleep up to 6 people..
•All room en-suite with flat screen TV & free wifi. Many rooms have microwaves & refrigerators. All rooms arte amply proportioned have modern en-suite bathroom facilities with fresh luxury towels. Our rooms include superior King room, Four poster Double and standard twin and double rooms. The motel has 10 rooms available which include single, double, twin and family rooms. Little Haywood General Store with B&B is a characterful and historic building with ancient connections to Cannock Chase. Seven Springs is a short distance from the village, making it an ideal base from which to explore. Our rooms above the shop are beautiful and comfortably furnished. We have paid every attention to detail to make your stay a pleasant one. We look forward to welcoming you. Stay in our Grade II listed farmhouse building dating back to 1690 set in middle of a 200 acre working farm overlooking Lichfield in an area of outstanding natural beauty. Grade II listed set in rural countryside, close to both junctions 12 and 13 of M6 in small market town of Penkridge. Close to all shops and facilities. The Lodge is a new B&B on the edge of Cannock Chase. Here you'll find comfortable, stylish rooms, a hearty breakfast, private parking and easy access to local pubs and amenities. We're conveniently located for access to the motorway and rail networks, near to the business centre of Cannock, and not far from the beautiful medieval city of Lichfield. Come and stay with us ! Whether you're travelling for business or pleasure, we'll try to make your stay as comfortable and enjoyable as possible. Independant, family run 14th century moated manor house incorporating award winning luxury hotel complex. Conveniently located on the edge of Cannock Chase, 1.5 miles from junction 13 of M6. The perfect venue for accommodation, conferences, functions and weddings. Located on the edge of Cannock Chase and surrounded by beautiful countryside, yet only a mile from junction 12 of the M6 and the M6 toll makes it the ideal location. The original farmhouse, dating back to around 1800, incorporates our reception and two of our smaller meeting rooms. The Olde Peculiar is a delightful village inn serving real ales, home made and home cooked food with comfortable B&B accommodation, family room and 2 twin rooms. Prices include full English breakfast. All rooms have en-suite shower rooms and include tea and coffee making facilities and are non-smoking. Family room consists of a general lounge area where the settee can double up as a sofa-bed, bathroom with shower, double bedroom and a separate single bedroom. Access is only available via stairs. Both twin rooms are accessible from the ground floor. Located 5 minutes outside Cannock town centre they have great access to main roads including the M6, M6 toll and the A5. Attached to the Orbital Brewers Fayre, which offers great food and drink, free parking and brilliant deals. The newly built Premier Inn which opened December 2008, offers superb king sized beds, plasma televisions with Free view, Wifi access and en suite and tea and coffee making facilities. Family friendly and offering great rates, the Cannock M6 Toll Premier Inn are confident that you’ll have a great night stay, as they even offer a Good Night Guarantee. Ideally positioned within easy reach of the M6. For shops and local amenities Cannock town centre is only 2 miles away. Conveniently located for Cannock train station. Opened February 2011 Rugeley Premier Inn has everything you'd expect, incredibly comfortable beds in all 50 modern room, free car parking, 24 hour reception, freeview TV, air conditioning and wifi access. We also welcome families with our family sized bedrooms, interconnecting rooms for larger families and we offer an 'all you can eat breakfast'* while the children can eat free. We also have a new stylish Table Table restaurant serving great value pub favourites in a family friendly environment. Our Premier Inn is situated in the historic market town of Rugeley which lies on the northern edge of the Cannock Chase. Ideally located approximately midway between the towns of Stafford, Cannock, Lichfield and Uttoxeter we are very close to local amenities and near by attractions, which include Cannock Chase Forrest, Alton Towers and Go Ape. An impressive luxury hotel ideal for an overnight stay or a short break in a superb location, ideal for exploring the local area. Luxury is our main feature with all our rooms designed to the highest standards with beautiful ensuite bathrooms. Accommodation is just part of the package. There is also the Brasserie at Lion Point and Bar with food and drink to tantalize your taste buds. The Hotel offers a choice of restaurants and bars serving a wide range of hot and cold food including an excellent A La Carte menu and a selection of light meals. Ideally located for visiting The Potteries, Staffordshire and Birmingham. Just on the A5, 3 miles from M6 junction 12 and 300 yards from junction T7 off the M6 Toll Road. We are ideally located for visiting Staffordshire. Just on the A5, 3 miles from M6 junction 12 and 300 yards from junction T7 of the M6 Toll Road. Our modern hotel was built in 1980 to a Roman theme, and is located on the outskirts of Cannock. Situated on the A5, under five minutes from M6 junctions 11 and 12, and also the M6 Toll road it offers easy access to the motorway network of the West Midlands and is well placed for Staffordshire, Derbyshire and the potteries. Our 56 bedroom hotel has a comfortable lounge/bar offering an extensive range of menus with a very relaxed ambience ideal for business and leisure guests alike. Situated adjacent to Cannock Chase, The Rag Country Inn offers an excellent location for walkers, mountain bikers and visitors to this area of outstanding natural beauty. The Rag Restaurant was opened in March 2004 and has an established reputation for serving high quality, home cooked food, which along with fine wines, helps to ensure The Rag provides a charming location for any occasion. In June 2012 seven tastefully decorated and spacious ensuite bedrooms were opened - Fairlady, Hollybank, The Fly, Leacroft, Plant, Grove and Valley. All rooms are ensuite with freeview TV, tea and coffee making facilities, complimentary biscuits, fruit, soap, shower gel and shampoo. There is a separate entrance that can be used for out of hours access and morning wake up calls are available upon request. No children under the age of 14. Sorry, no dogs or pets allowed. Situated on A51 in the centre of Rugeley, this Travelodge has recently been refurbished and has a Burger King & Petrol Station on site. There are 50 parking spaces available free of charge, and early check-in / late check-out is available (pre-bookable online). Six beautiful self catering Holiday Cottages on the edge of Blithfield Reservoir, a 750 acre lake, in the heart of the lovely Staffordshire countryside. The cottages vary in size and accommodation but are all converted barns furnished to the same excellent standard. "Tranquillity close to the heart of England"
Cannock Chase has rolling hills, heathers, quiet forests and wild fallow deer. On the edge of one of the Midlands’ most popular beauty spots, it is great for walkers as well as those exploring further afield. A newly renovated self-catering cottage in the heart of Cannock Chase. Hidden away in its own secluded valley, an idyllic resting place. Luxury 2 bedroom detached self-catering bungalow on Cannock Chase. Solid Oak floors, good furniture. Sleeps 4 + cot . Springslade Lodge offers a private hide away campsite, situated off the road in pine forest on Cannock Chase in Staffordshire. Close to Cannock & Stafford for all your shopping needs. The camping and caravan site caters for tents, caravans and motor home camping, the area is natural ground with a good access track, there is water and drain facilities on the site. Tearoom is available for hot and cold food subject to opening times. Silvertrees has a David Bellamy Gold Award grading for the conservation of wildlife - awarded for three years running 2008 to 2010. Family owned Holiday Home Park on Cannock Chase with its own Nature Reserve designated a SSSI from which deer venture on to the Holiday Park and wander through the grounds so visitors can enjoy great close-up views. Hire a modern Holiday Home for short breaks or weekly holidays, enjoy a stay in the midst of a natural landscape which is unique, peaceful and a relaxing oasis away from the stress and activity of modern life. Enjoy owning a modern Double Glazed centrally heated Holiday Home in the midst of Cannock Chase which is designated An Area of Outstanding Beauty. Watch the wild deer and birdlife from your Decking Veranda or enjoy walks and cycle paths across the Chase. For information on holiday season and latest tarriff please contact the park. Stables Court Apartments are contemporary two bedroom ground floor self catering apartments offering a complete ideal alternative to hotel accommodation. Each apartment is fully furnished complete with all essential items including complementary broadband Wi-Fi and car parking. Adjacent to Stables Court is the popular village public house “The Olde Peculiar” offering a comprehensive menu including many homemade favourites together with a range of real ales. 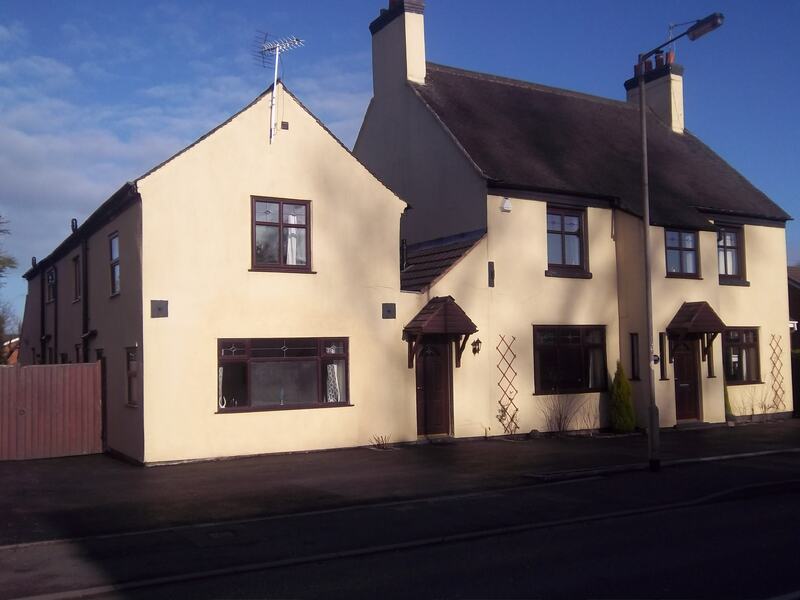 Located on the Penkridge Bank Road approximately 4 miles outside of Rugeley. Signposted from the Penkridge Bank Road and just 1.5 miles from the Birches Valley Forest Centre . This Class B site is the ideal place to come and relax with only the deer for company. The site welcomes tourers from 1 April to 1 December. Freely drained hard standing pitches, running water, information board and sanilav disposal points are the only facilities on site. However, within a short distance of the site there are places to eat, hire cycles, woodland play area, waymarked trails, fishing pools and much, much more. There is no booking system for this site for private users. Please contact the main office for rally dates to be arranged. • Education service and events programme located just 1.5 miles from the site. • This site is for touring caravans only. No camping is permitted anywhere on this site. • Located within 5 minutes walk of Tackeroo permanent orienteering course. • Only BBQ raised off the ground are permitted. OPEN FIRES ARE PROHIBITED. PLEASE NOTE THAT THE CAMPSITE WILL BE CLOSED FOR PUBLIC CAMPING AND CARAVANNING UNTIL MONDAY 23RD OF OCTOBER, APART FROM PRE-BOOKED PITCHES ONLY 7TH TO 10TH JULY. PITCHES CAN BE PREBOOKED BY CALLING 0300 067 4340.